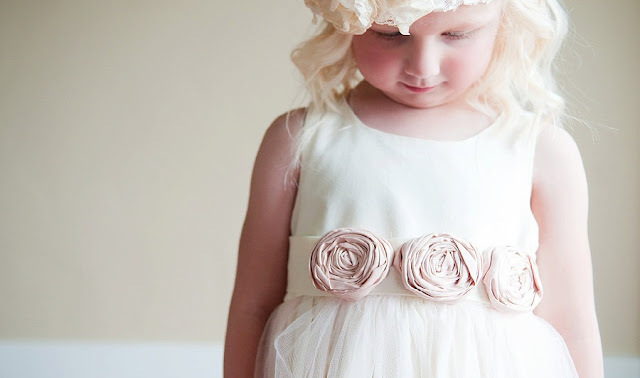 While choosing a dress for a flower girl, the first thing that you have to keep in mind is the age of the girl. Flower girls are usually 4 to 8 years old and therefore, you can’t choose a dress that makes her look mature and older. Always go for a dress that is appropriate to wear for a young girl. You should be considerate of her age and therefore, the dress shouldn’t be fitted. Instead, it should be stylish yet comfortable so the flower girl won’t be pulling at her dress, tripping down the aisle or shedding tears due to discomfort. Make sure that the dress you hire is affordable because the child is only going to wear it once or twice and then she’ll grow out of the dress and won’t be able to wear it again. Therefore, although the dress should be beautiful it shouldn’t be very expensive. Although it is a tradition that the flower girl wears a knee length frock with a lots of frills and flairs but you shouldn’t be afraid to think outside the box. It would look quite elegant if your flower girl is wearing a chic and formal pantsuit. It would make your wedding look quite sophisticated. A stunning color, rhinestone buttons, lace borders - all of these can make a beautiful addition to the wedding party. Keep in consideration the height of the flower girl and choose a dress of appropriate length. The frock shouldn’t be too long for the girl to trip and fall and it shouldn’t be too short that looks inappropriate for a child. Ideally, the frock should reach the middle of the calf. When the girl is quite young, she would grow quickly. If you are making a custom-made dress, then wait for the last days to get the dress stitched. Otherwise, chances are that the dress won’t fit the flower girl. This will avoid having the flower girl outgrow the dress before the wedding. When choosing a dress, don’t forget to shop for the accessories as well. You would have to complete the entire look of that beautiful young lady. Choose hair ribbons or bows or flowers or a tiara for her hair. The dress you choose should be of a color appropriate for a kid. It should either be white or any other pastel color. However, if you are having an evening wedding, then you can choose a darker shaded dress for your flower girl. Many brides while choosing the dress for a flower girl forget to choose a similar one for the ring bearer. As this pair has to stand side by side, it should be considered that their dresses complement each other and form symmetry. Choose their attire at the same time; don't make the Ring bearer an afterthought or the two children may not coordinate well together. Don’t forget that the flower girl is a child and her dress should reflect that. The dresses with a lot of frills and frails are the most popular options. The dress that is designed should be feminine, frilly and celebrate childhood.